Impala Place - Marloth Park Accommodation. While you enjoy a relaxing swim in the swimming pool, you can listen to the cry of the African fish eagle or listen to the sounds of the hippos snorting in the nearby Crocodile River. Listen to the roar of the lion while sitting around the fire in the boma. 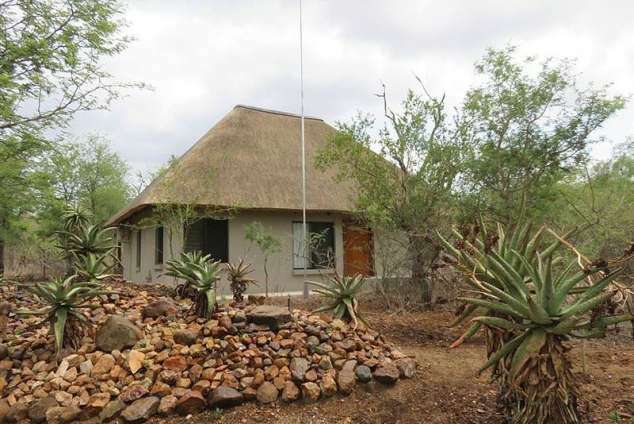 Ideally situated for day trips to the game-rich southern areas (Lower Skukuza and Malelelane) in the world renowned Kruger National Park situated just across the river, a 20 minute drive away. An afternoon drive along the Crocodile River will afford you the sight of the African giants, the elephants, grazing in the reeds along the river. Then back to Impala Place for a traditional barbecue under the African stars that twinkle like diamonds. While you gaze into the fire and experience the freedom of the African bush you can forget about your cares and experience a wonderful release of tension and anxiety so that you can go home refreshed and rejuvenated. Marloth Park is a bird watcher's paradise - more than 300 bird species have been identified in the area so far! You can relax in the comfort of an air-conditioned house and enjoy the convenience of each bedroom having its own bathroom. You also have television and videotapes to watch and books to read. The air-conditioned main bedroom is ideal for a honeymoon couple or a romantic encounter in a bath big enough to accommodate two people as well as a shower. It also has its own balcony that looks out onto the African bush and at night the millions of stars in a clear sky. A four-hour drive from Johannesburg, or a one-hour drive from the Kruger Mpumalanga International Airport at Maputo, Mozambique (an hours' drive from Marloth Park and situated at the sea) and the kingdom of Swaziland (less than an hour's drive). Please note that no domestic animals are allowed in Marloth Park. 4 spacious bedrooms with double beds, 3 with en-suite facilities and one stand-alone bathroom. A large enclosed, air-conditioned veranda (can be partitioned if required) has four single beds. Excellently appointed kitchen, including microwave and eye-level oven. Comfortable, air-conditioned living areas. Satellite TV Ceiling fans in all bedrooms. Boma (Barbeque area). Extensive outdoor living areas. Under-cover parking for two vehicles. All linen, towels etc. Fully serviced by domestic assistant. Swimming pool. Large swimming pool. Filling station. Mini supermarkets for essential items. Restaurant and Bar. Access to Lion Spruit Private Game Reserve, Marloth Park's own game reserve. Golf in Malelane (both 9 holes) and Leopard Creek (18 hole championship course). Close to the borders of both Swaziland and Mozambique. Game drives, as well as night drives, in the Kruger National Park. Tigerfish angling at Komatipoort. 39093 page views since 14 Jan, 2004.